Due to their simplicity and flexibility, NAS storage solutions have proven invaluable to enterprise organizations as in-house solutions for file sharing, backup, and archive needs. The emergence of server virtualization, private and public clouds, and the need to support an ever-increasing mobile workforce has led to increased demands in the performance, capacity, security, and connectivity of NAS storage solutions. With an ever-increasing need to manage and protect a growing amount of unstructured data, it is no small surprise that respondents to ESG research have identified hardware costs, rapid data growth rate, data protection and migration, and staff costs as top storage challenges faced by enterprise organizations. Storing, protecting, and managing access to such a large mount of unstructured data is costly both in terms of capital expenses (hardware and software) and operational expenses (management and expertise). Creating an effective and complete data protection solution can be a daunting undertaking for many organizations. The number one priority should be obvious: the successful and timely recovery of business-critical application and platform data. However, achieving efficient data protection storage management to meet various internal and external mandates is also important. Because of the many moving parts, seamless integration of multiple disciplines is critical in creating a data protection environment. In fact, according to the ESG research report, Data Protection Personas and Methods, more than half of the organizations surveyed report that they now utilize workload owners such as database administrators for daily data protection activities for their respective resources. NetBackup Copilot for Oracle is an efficient, feature-rich solution for database protection. It integrates components of the NetBackup application, Oracle Recovery Manager, and the NetBackup appliance to manage database backups. As shown in Figure 1, Copilot uses a slice of the NetBackup appliance integrated storage pool to present a snapshot capable NFS share to an Oracle database server as a backup target. There is no room for compromise when you’re talking about data storage, protection, and access. Data drives every business process, from R&D through production applications to analytics that help design your future. Unfortunately, many storage solutions force a tradeoff: performance vs. cost savings; protection vs. capacity; features vs. simplicity. Flash technology can dramatically improve performance, but the cost of all-flash arrays can be prohibitive. Snapshots can provide recovery points, but cannot be taken often enough to ensure a full recovery; they also take up growing amounts of storage space and management effort. New storage features can be helpful, but many organizations fail to take advantage of them because they add complexity. 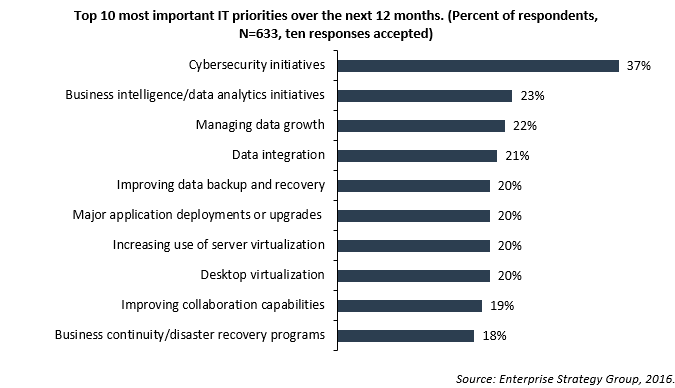 ESG asked 633 IT professionals and managers to identify their most important IT priorities, and more than one-third (37%) flagged cybersecurity initiatives, making it the most-often cited response by a wide margin, as shown in Figure 1. In addition, 46% of respondents indicated that they believe their organization has a problematic lack of information security skills, the number one response for the third year running. Advanced malware attacks can cause tremendous damage to an organization, from stealing data through compromising identities to shutting down operations. The cyber-criminals perpetrating these attacks are sophisticated—continuously adapting the latest exploits, and creating new and insidious methods of infiltration and attack. Current malware is far more subtle and refined than the malware of the past, and is often camouflaged to prevent identification by traditional security systems. 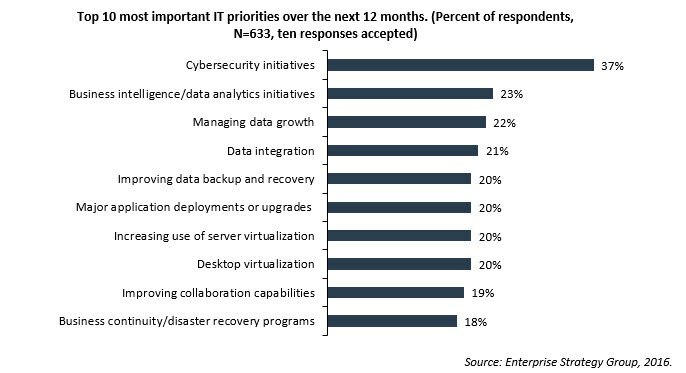 ESG recently asked a sampling of IT professionals and managers to identify their top IT priorities, and 37% of respondents noted cybersecurity initiatives as one of the highest IT priorities within their organizations in 2016 (see Figure 1). In the same survey, 75% of organizations indicated that they currently use public cloud services for a wide variety of applications, with 19% planning to use the public cloud in the near future. Respondents also stated that providing employees with mobile devices and applications is one of the initiatives driving the most technology spending at their organization over the next year, while 20% identified interaction with customers on their mobile devices.